We love festive mocktails here at AdventureYogi, see some other recipes, here! Grapefruit is one of my favourite fruits for mocktails, the delicious sweet and sour taste and gorgeous pink colour make the perfect pairing with a variety of herbs. We’re using Rosemary for this one. You’ll need to make a simple sugar syrup in the same way as we did for the previous recipe but this time replace the basil with 3 sprigs of rosemary and let steep for at least one hour. 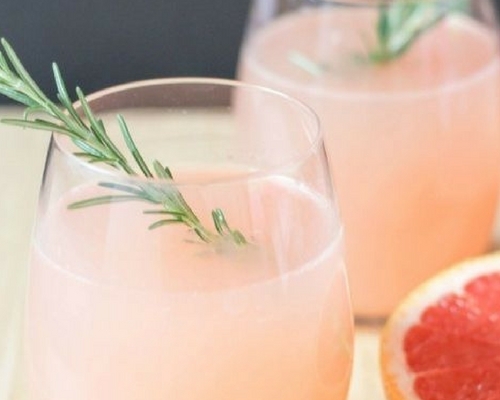 Pour 1/2 cup of fresh grapefruit juice, 1 Tablespoon (1/2 oz) of the rosemary simple syrup and top the glass with sparkling water (about 1 cup). Play around with these measurements until you find the balance that’s right for your palette. Garnish with a wedge of grapefruit and a sprig of rosemary. You just get a heavenly scent every time you take a sip.